the colors and accessories make Dirge an excellent display piece in either Jet or Bot modes. make the figure stand apart from the other Seekers. but both in his original color scheme. of the G1 character. Very clean lines and nice paint apps further the G1 look. clean, not overwhelmingly noticeable, they are there. 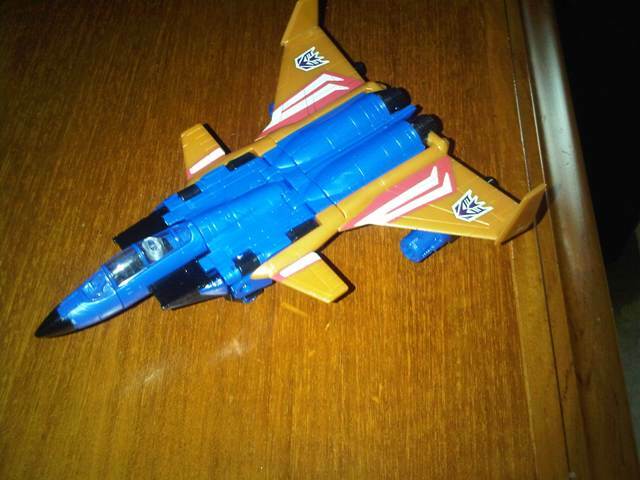 blue paint would make him streamlined in alt mode without affecting bot mode at all. sides of his intake cowls were made the primary body color, unlike Uni Starscream. joint problems notably in the hips, the arms are nice and tight though. 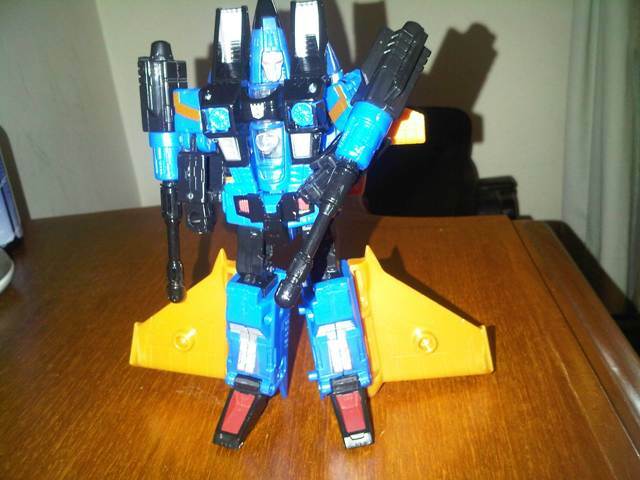 so I am glad Dirge came with the thinner, better looking missiles from Screamer. unlike Generations Thrust, 90% of his wings stay on his legs, when in his bot mode. when they could have had Con symbols or something on them. The tiny white outlined symbol on his chest is weak compared to the rest of the figures apps. do, so keep that in mind as to not break them. color of Classics Ramjet and the G1 styled orange on Uni Starscream. Articulation: 10, Easily posed and does not have the wing hindrance that Classics Starscream and Skywarp have when posing the arms for a forward shooting stance. Bot Mode: 9.5, I thought that he should have had blue thighs, and no red in his feet, and missing some con symbols. Alt Mode: 10, His alt mode is right up there with Thrusts' very clean and attractive. Durabilty: 8, This mold has issues mostly in the hip department, the hip ball joints are often not as tight as they should be. Packaging: 10, I myself really love the Generations / "Transformers" 2010 packaging. The Jet is very well displayed inside the bubble and the artwork is really good. And the new ties used to hold it in place are actually a good idea, great to reinstall back onto the card, and easily tied. Only complaint is that due to the smaller bubble, he had to face opposite the rest of the Generations line on the card...but not a problem for anyone who opens theirs. Price: 10, $9 to $9.99 at a few stores is never a bad price for a decent deluxe figure. Overall: 9, His looks are definately Dirge and even with the few loose joint issues he is a very nice figure and looks good displayed in either mode.